The 1997 Mine Ban Treaty marks its 14th anniversary on March 1, counting 161 States Parties, but lacking support from countries including China, Iran, Russia, Syria and the U.S. More than 1.1 million people have signed Handicap International petitions pushing for the eradication of landmines since 1995. As a fellow Nobel Peace Prize winner, President Obama has the moral responsibility to take a firm stand against landmines. February 28, 2013—Handicap International is calling on the Obama administration to join the 1997 Mine Ban Treaty. The life-saving treaty marks its 14th year of entry into force on March 1, counting 161 States Parties, but countries including China, Iran, Russia, Syria and the U.S. have yet to join. More than 1.1 million people have signed Handicap International petitions pushing for the eradication of landmines since 1995. In the past five months, the charity has collected an additional 52,868 signatures—34,082 from Americans—urging President Obama to submit the treaty to the Senate for ratification now. The U.S. has an estimated stockpile of 10.4 million anti-personnel mines. However, it has not used antipersonnel mines since 1991 or produced new ones since 1997. The U.S. is the only member of NATO and the only country in the western hemisphere, aside from Cuba, that has not joined the treaty. Despite not being a States Party to the treaty, the U.S. has committed more than any other country to landmine clearance, victim assistance, and other mine action, supplying $534.5 million in aid since 2007. The Treaty prohibits the use, stockpiling, production and transfer of anti-personnel landmines. 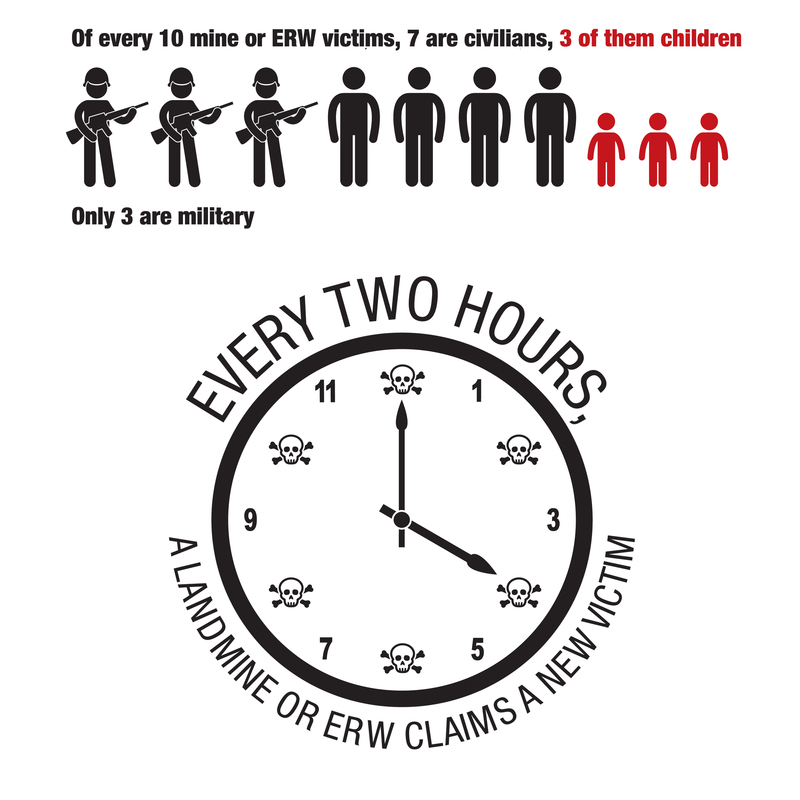 Since its creation, almost 4,000 km² of mined land has been cleared and nearly 135 million landmines have been destroyed. However, millions of landmines, some dating back to World War II, still lay hidden in more than 60 countries. These indiscriminate weapons and other explosive remnants of war (ERW) cannot mark the difference between the step of a solider or that of a child. They claim roughly one new victim every two hours. According to the 2012 Landmine Monitor, more than 70 percent of victims are civilians and of these, 42 percent are children. The report also states that there are hundreds of thousands of landmine survivors and most will need support for the rest of their lives. The Mine Ban Treaty was signed in 1997, following the campaigning of Handicap International and five other organizations. For its efforts, Handicap International and its partners were jointly awarded the Nobel Peace Prize that year. In 2009, President Obama launched a review of the U.S. landmine policy to determine whether the U.S. will join the treaty. In a statement delivered in December, at the 12th Meeting of States Parties to the Mine Ban Treaty in Geneva, Steven Costner, deputy director of Weapons Removal and Abatement at the U.S. Department of State, said “our review has identified operational issues related to accession that require careful consideration. This consideration is ongoing, and we expect to be able to announce a decision soon.” He later defined “soon”—before the November 2013 Meeting of States Parties. “As a fellow Nobel Peace Prize winner, President Obama has the moral responsibility to take a firm stand against landmines,” says MacNairn. Handicap International is the world’s most comprehensive mine action charity, helping victims of landmines and ERW, preventing causalities by clearing and destroying mines and ERW, educating affected populations about the risks, and advocating for an all-out ban on landmines and cluster munitions. The organization has run mine action projects in nearly 50 countries. Co-winner of the 1997 Nobel Peace Prize, Handicap International is an independent international aid organization. It has been working in situations of poverty and exclusion, conflict and disaster for 30 years. Working alongside persons with disabilities and other vulnerable groups, our actions and testimony focus on responding to their essential needs, improving their living conditions, and promoting respect for their dignity and basic rights. Since 1982, Handicap International has set up development programs in more than 60 countries and intervenes in numerous emergency situations. The network of eight national associations (Belgium, Canada, France, Germany, Luxembourg, Switzerland, the United Kingdom and the United States) works constantly to mobilize resources, jointly manage projects and to increase the impact of the organization's principles and actions. Handicap International is one of six founding organizations of the International Campaign to Ban Landmines, and winner of the 2011 Hilton Humanitarian Prize. Handicap International takes action and campaigns in places where “standing tall” is no easy task.